Get your papers organized in an instant. Our Durable Preprinted Plastic Dividers help you get sorted as soon as you put them in your binder or notebook. 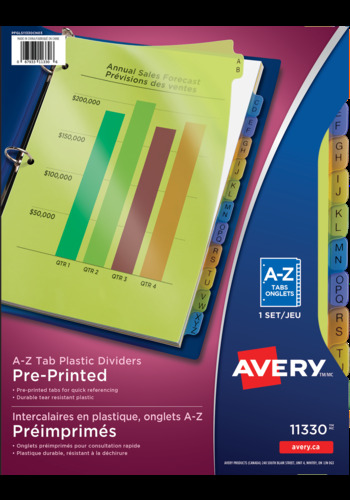 Three-hole punched and ready to use, the dividers come with tabs preprinted with the alphabet on 12 tabs. Get your papers organized in an instant. Our Durable Preprinted Plastic Dividers help you get sorted as soon as you put them in your binder or notebook. Three-hole punched and ready to use, the dividers come with tabs preprinted with the alphabet on 12 tabs, so you can achieve fast alphabetical organization. The sturdy plastic material offers a durable solution that lets you thumb through dividers again and again, and the assorted colours make it easy to find what you need.